Final installment in a historical trilogy (A Singular Hostage, 2002, etc.) setting a feisty English heroine against a backdrop of political upheaval in Victorian-era India and Afghanistan. In March 1841, Mariana Givens settles in a British fort north of Kabul with her Aunt Claire and Uncle Adrian, a colonial intelligence officer. Surrounded by military and government officials’ families, Mariana hides the fact that she is still married to Hassan Ali Khan, a Punjabi Muslim courtier whose household in Lahore, India, she fled several weeks earlier. After overhearing him discuss an Englishman’s attempt to assassinate the new maharajah, she wrongly accused Hassan of plotting to kill her aunt and uncle, their British traveling companions, perhaps even herself. Demanding a divorce, Mariana bolted, but she soon rues her hotheadedness. She misses Hassan and her four-year-old stepson Saboor, a pint-sized diviner who remains in Lahore with his father and grandfather, a famed Sufi mystic. Receiving no response from Hassan to her apologetic letters, Mariana reluctantly accepts the renewed attentions of an English lieutenant but secretly consults a Kabul soothsayer about her romantic destiny. She also observes the mounting unrest of local tribesmen under Shah Shuja, installed in 1839 by British forces after they ousted the Afghan king. As warfare erupts, Mariana finds her loyalties divided; she eventually seeks asylum from a fierce chieftain allied with the deposed king’s son. Pluck, Qur’anic verse, invocations of Allah’s blessings and Saboor’s otherworldly powers guide her back to Hassan. 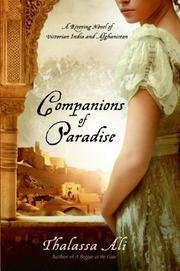 Mariana passionately defends Islam and its practitioners against the prejudices of the “self-satisfied, overstuffed people” who comprise the worst of her peers, but the novel never explores the implications of having as its protagonist a white adventuress who is preternaturally understanding of native customs. Painstaking reconstruction of a period with great contemporary relevance, marred by one-note characters and the use of heavy-handed shtick such as dreams to advance the plot.